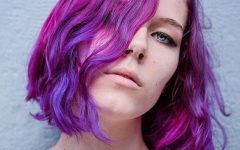 Lavender hair color is generally regarded as a pale tint of purple, but the term can also be used to describe grayish, medium, light, and pale shades of purple. This is a wonderfully feminine color as it puts us in mind of perfumed soaps and lavender flowers. 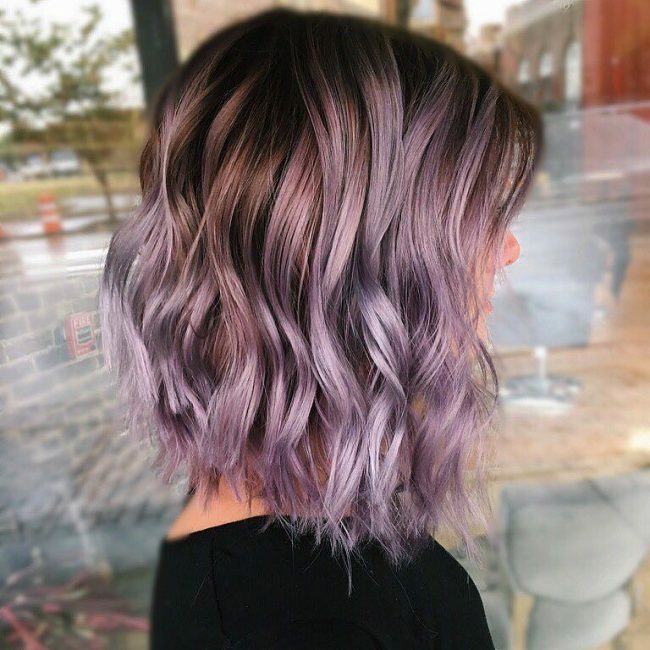 Lavender makes a great choice for hair color as there are many shades to choose from ranging from the lightest pastel to shocking electric shades. 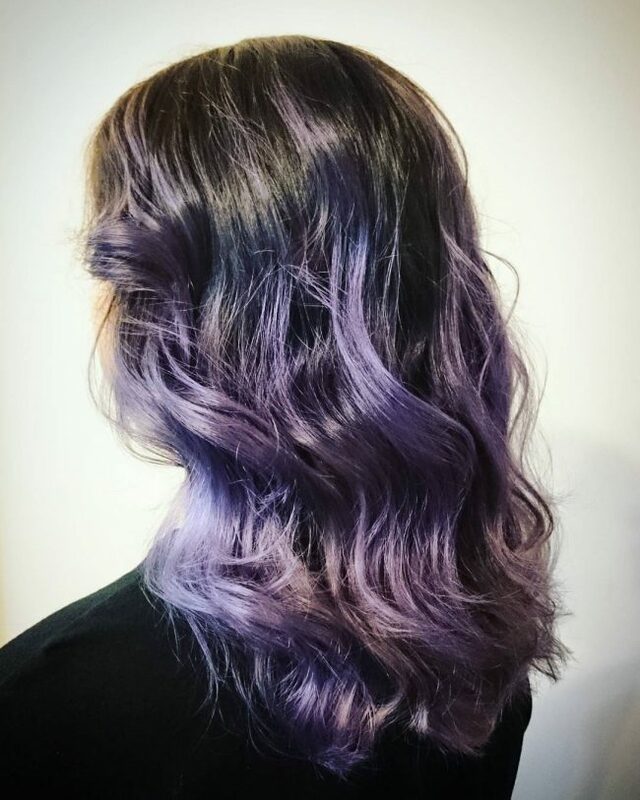 Whether you want full color, dipped tips or an ombre, lavender hair is definitely a style you should try. 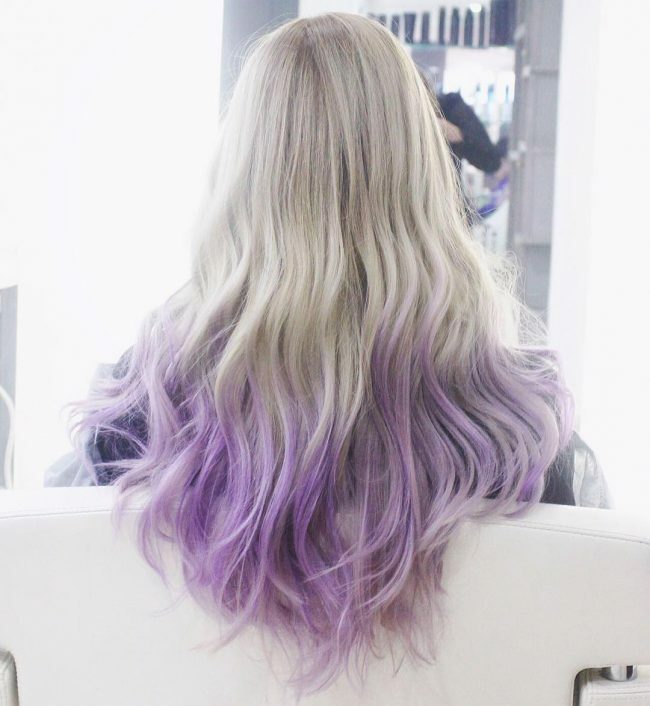 To inspire you we have collected 50 incredible examples of ladies with lovely lavender locks – hope you enjoy them! 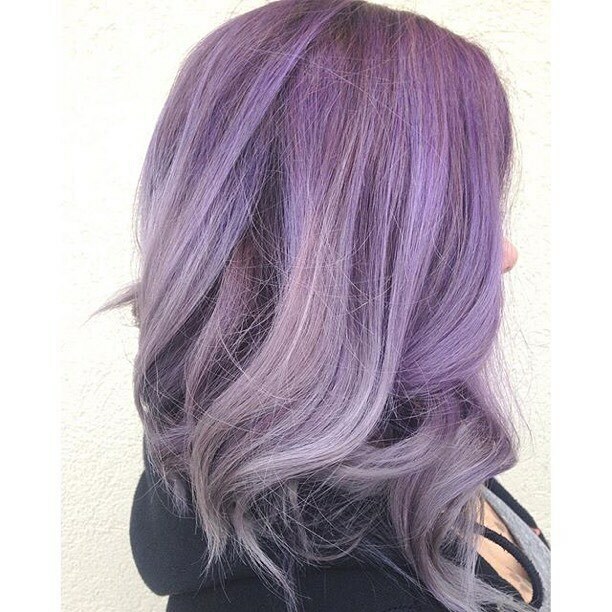 Gray is a hot hair color right now and it is also the perfect complement for a lavender shade like the one we see here. 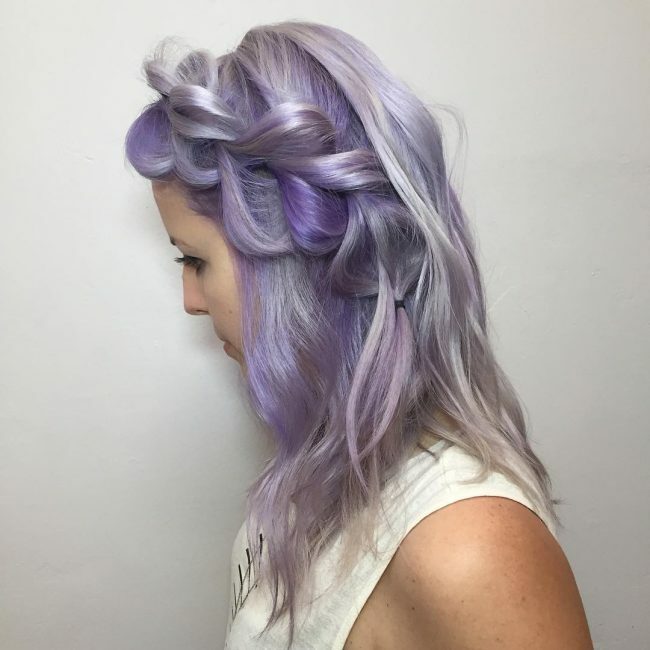 This look starts with a soft dove gray on the roots which has been covered with light lavender streaks. 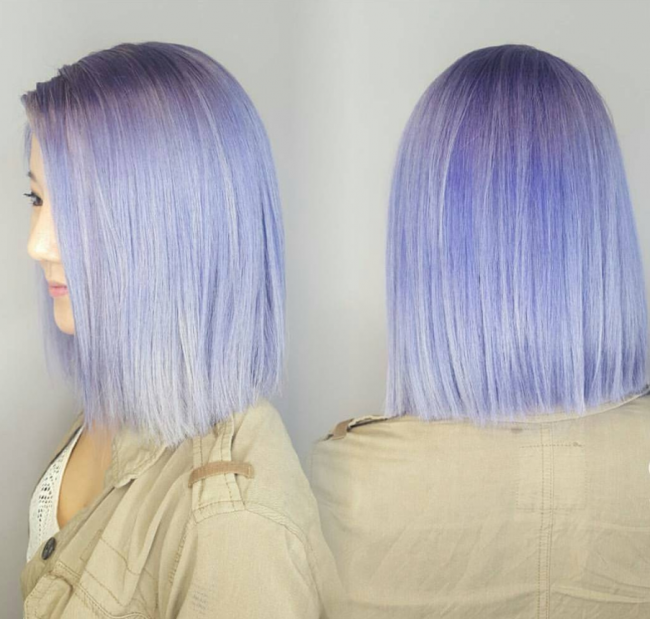 This lavender color continues until the tips and the gray has been used throughout to provide contrast. 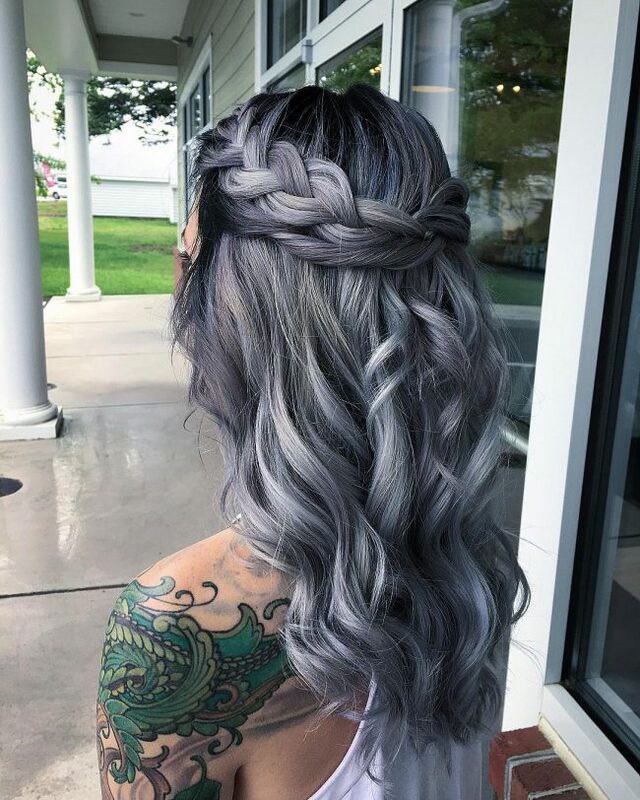 At first glance, these locks appear to be a solid silver color, but if you look closer you will see that different shades have been used to create this stunning look. For the base color, a blue-silver shade has been used and ice-white streaks have been added on top. This white color dissolves away into shimmering pastel purple along the edges. 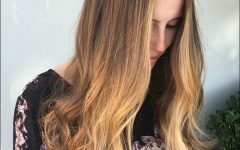 To infuse different shades like this balayage is the best method. 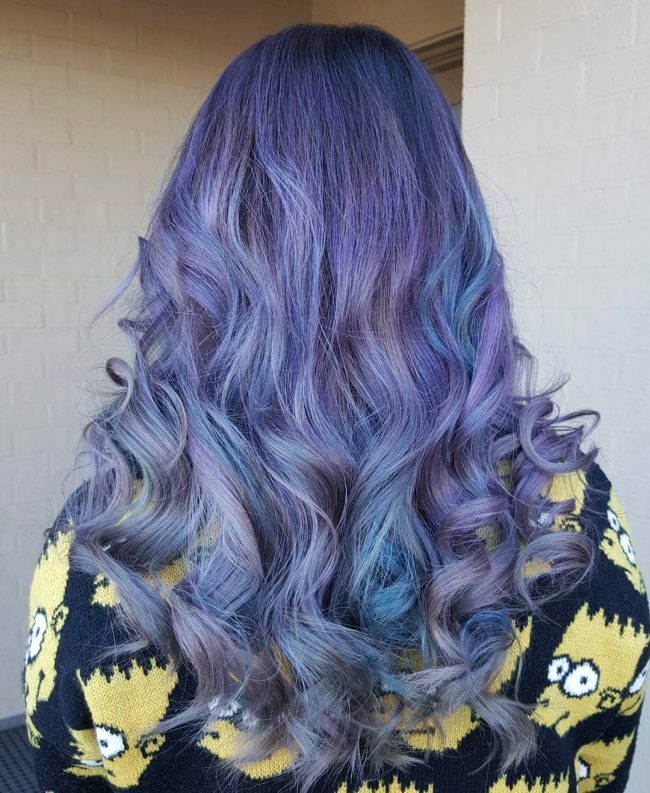 Here we can see how the freehand color technique has been used to blend lavender, pastel purple and sky blue together. Giving the hair loose S-shaped waves also helps to mix the colors together. 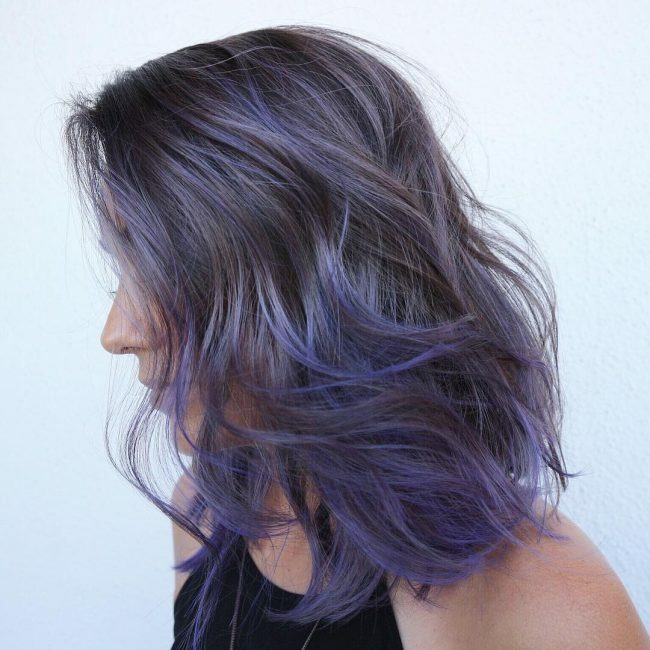 This look starts with iron gray across the roots and streaks of light gray and blue-violet on top. 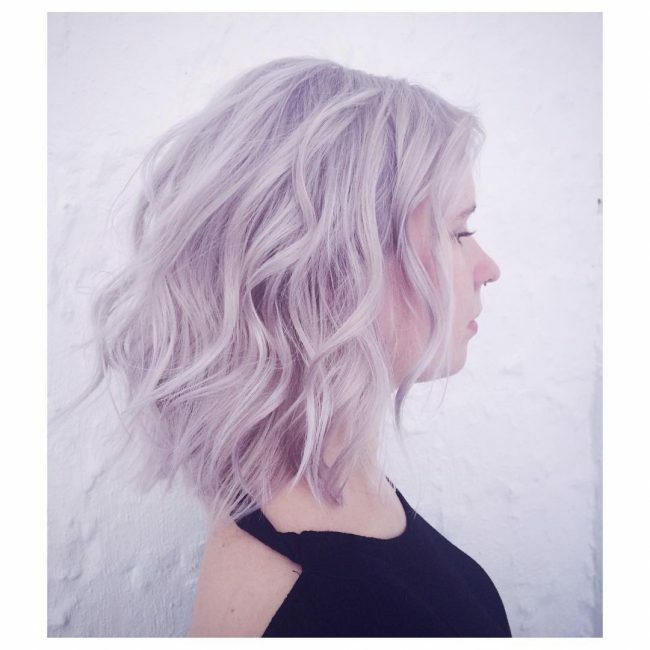 The darker gray color has been carried through the locks, which brings out the lavender shades. There are also a few smoky white babylights which have been added in the center section of hair. Purple is a color that was once reserved for royalty and it’s easy to see why! This luxurious mane begins with a smoky black base that quickly gives way to a royal purple shade. 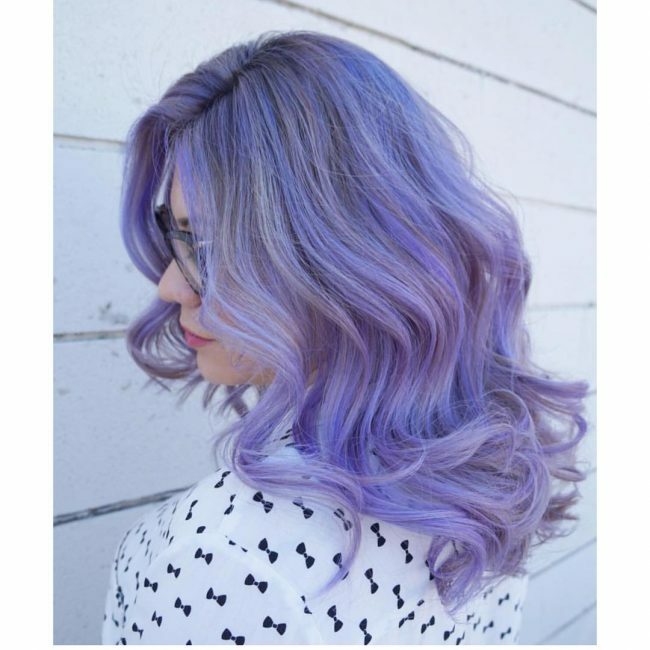 This shade melts into pastel lavender which lightens until it reaches the tips. On top of the purple, streaks of cyan blue have also been added. 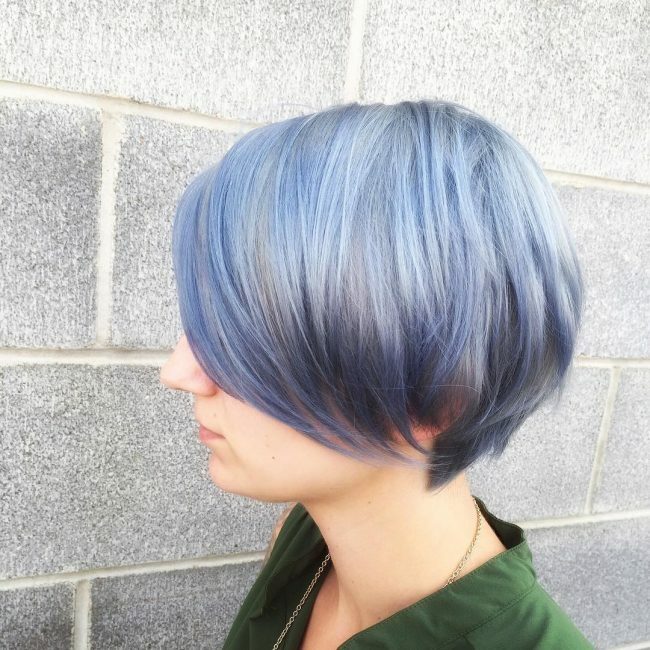 Metallic colors are vibrant and fresh making them a perfect choice for hair color. Her shoulder length locks start out in a sable shade which fades to a golden brown. From this level down streaks of silver and very light lavender have been added. To finish the look and help the shades blend, the hair has been given a gentle wave. In this picture, we see a model with waist length hair that has been streaked with quite a few different colors. We can see a dark brown that has been used as a lowlight as well as light pastel purple and honey butter blonde. She is wearing her hair draped over her chest which helps emphasize the length and coloring. When you have a funky haircut you are going to want a hot color to go along with it. Lavender is an ideal choice because it’s edgy but still feminine! 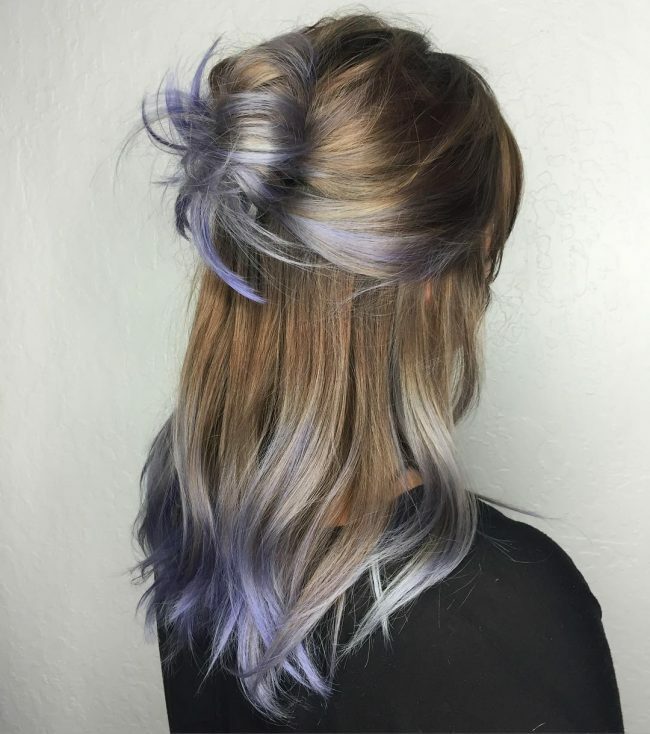 In this look, the stylist has given the hair a high undercut and colored the top locks in light lavender and blue-violet shades. The razor cut hair underneath is a dark brown which helps the purple shades pop. In this picture, we see a fishtail braid that has been fashioned using the upper locks. 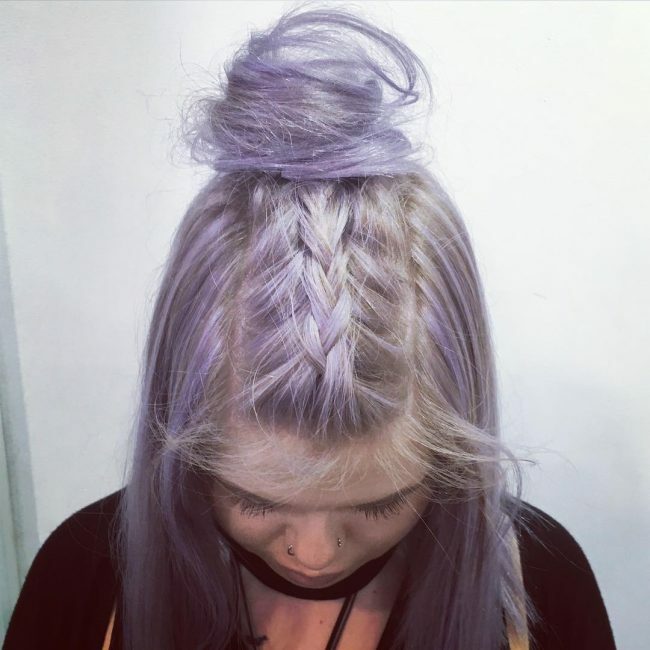 Within this braid, we see shades of silver-white and pastel purple. At the parting, the purple has been used once more, but this time together with a deep brown. 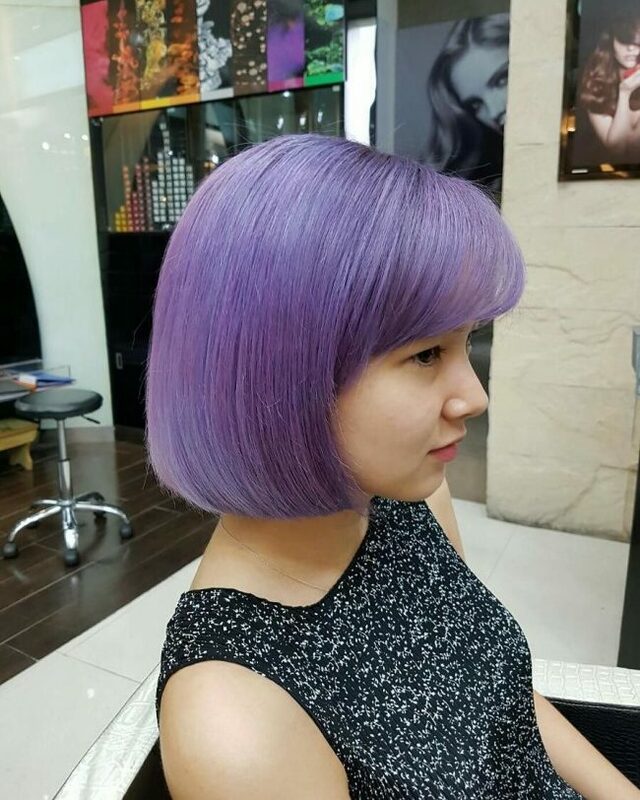 This model is wearing a sleek rounded bob with a full fringe that has been colored pastel lavender. There are some very subtle highlights as well in pastel blue-violet along the sides. This hairstyle and color are easily smart enough for both work and play. 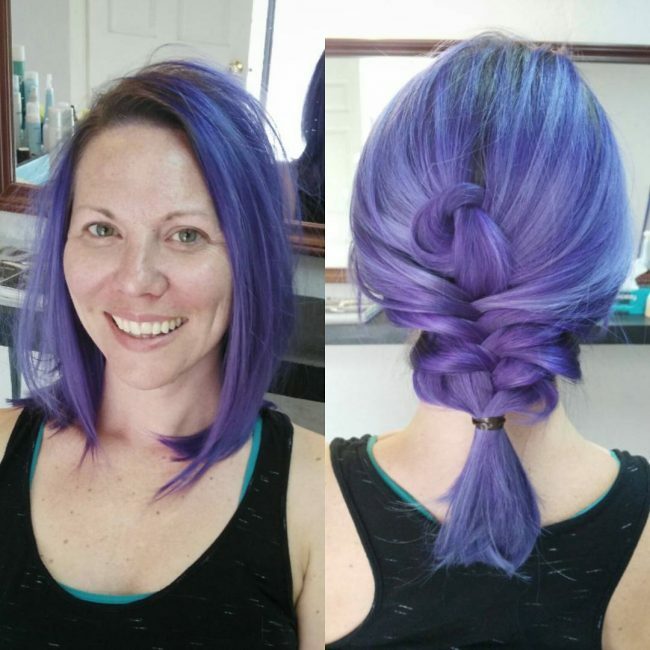 If you are not yet ready to color all your hair purple why not start with a look such as this? She has chosen a palette of golden browns and blondes for most of her locks and used understated light lavender to color one streak. This combination will draw attention and help you decide if you want full lavender color. 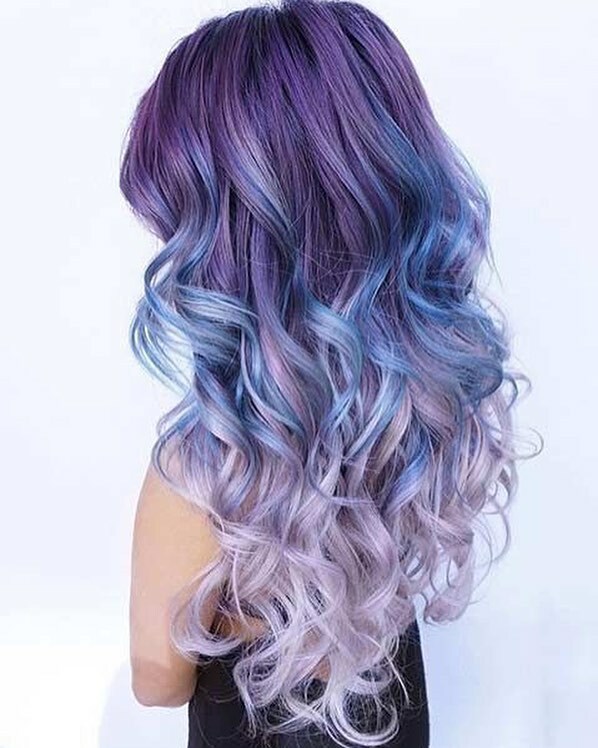 In this ombre mauve and blue-violet have been used to color the hair. We can see how the lighter color was used more densely towards the middle, which ties in well with the wavy styling. The hair has been given a center parting to help showcase the expert color fusion. For this look, the stylist has used lovely silvery brown shades with dark lowlights to give this hair dimension. The edges are finished off in wine and royal purple, creating a lovely dipped effect without being over dramatic. To help soften the look further, there are also a few platinum babylights scattered throughout the locks. 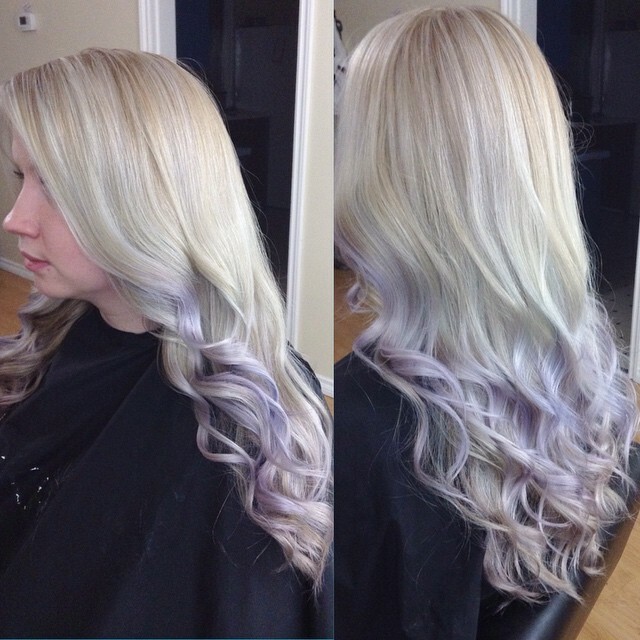 Pastel colors are ultra trendy and look great when the hair has been given a wavy finish like the one we see here. 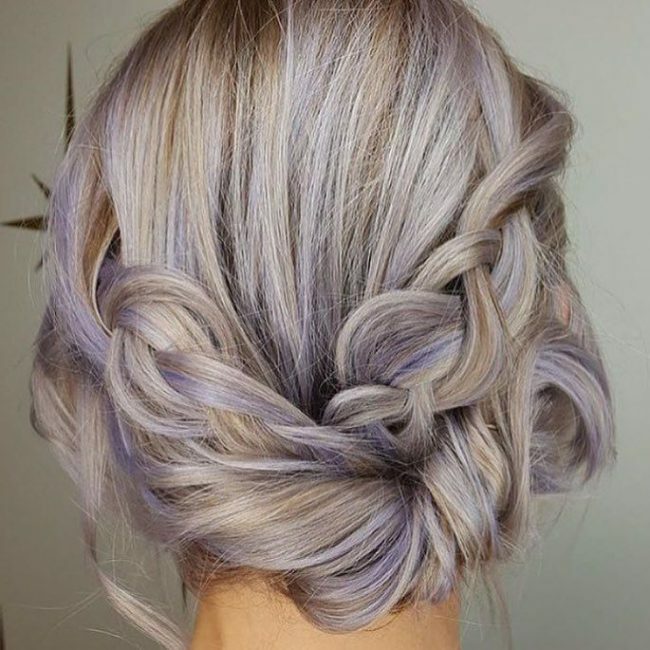 This look has been created using silvery grays, ice white, and a pale purple shade. To show off the color two mini buns have been added on top while the rest of the hair hangs loose. Here the hair has been colored a warm brown at the roots which quickly gives way to a cascade of stunning purple shades. 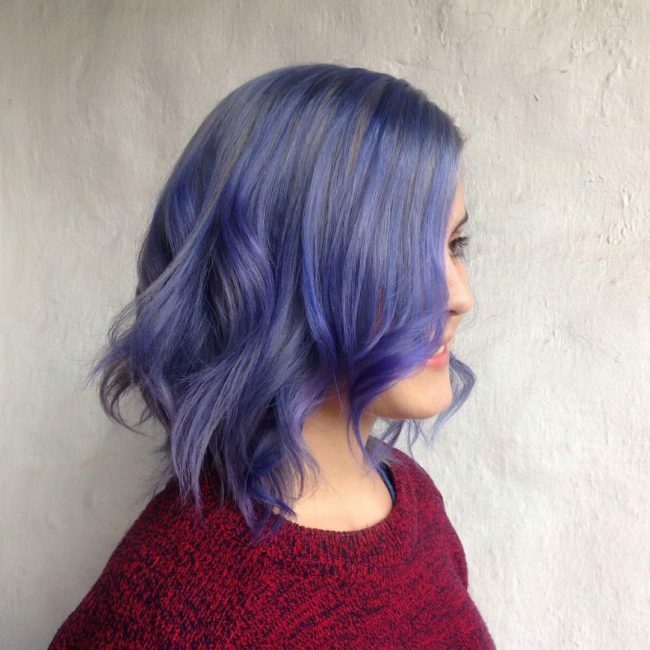 The top layer consists of powder and sky blue shades which melt away into a pretty berry purple. Within the mix of these colors, we can also see streaks of silver which have been used as highlights. In this look, the base color is an espresso brown which extends until past the crown where it gives way to brighter colors. A range of streaks have been added; sky blue, mulberry purple, silver and just a splash of rose pink as well. These locks have been ironed straight with just a little curl added over the tips. 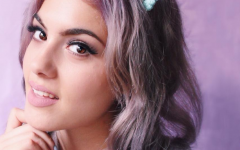 At first glance, you could think her hair is silver, but actually, it is a mixture of vivid pastel purples. 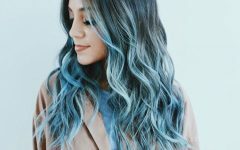 The hair is lightest towards the edges while the middle section has a slight blue undertone. Over the pastel purple, we can also see a few ice white babylights. Within this hairstyle, dark brown has been used as a base color. 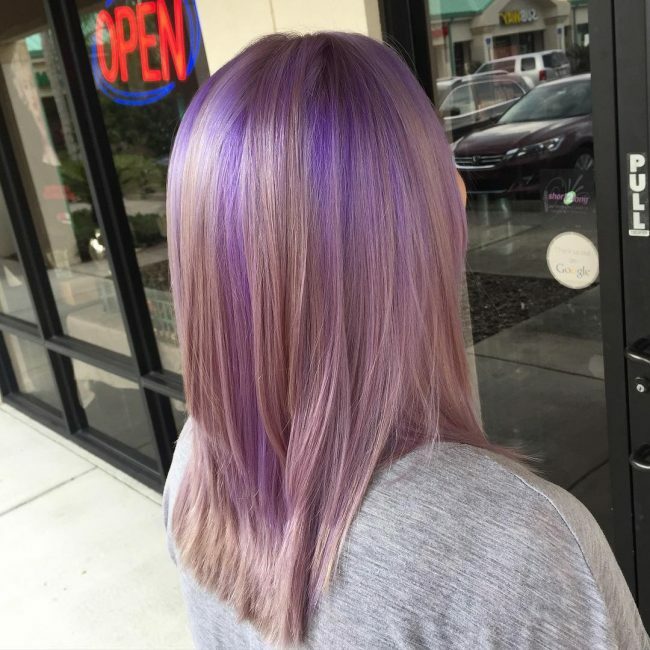 The majority of the locks have been colored in shades of honey and butter blonde with soft lavender streaks scattered within. This loosely braided updo brings these strands together, making the color more noticeable. 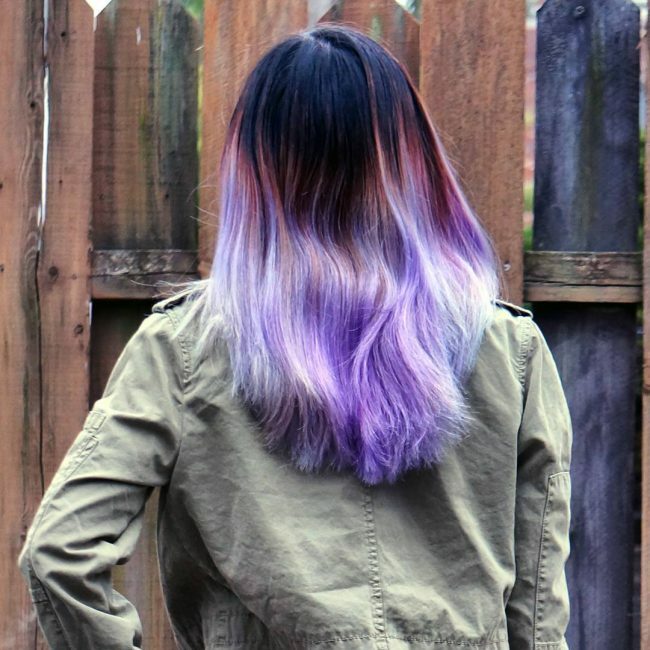 Take purple hair to the next level and try a dark to light ombre like she has. 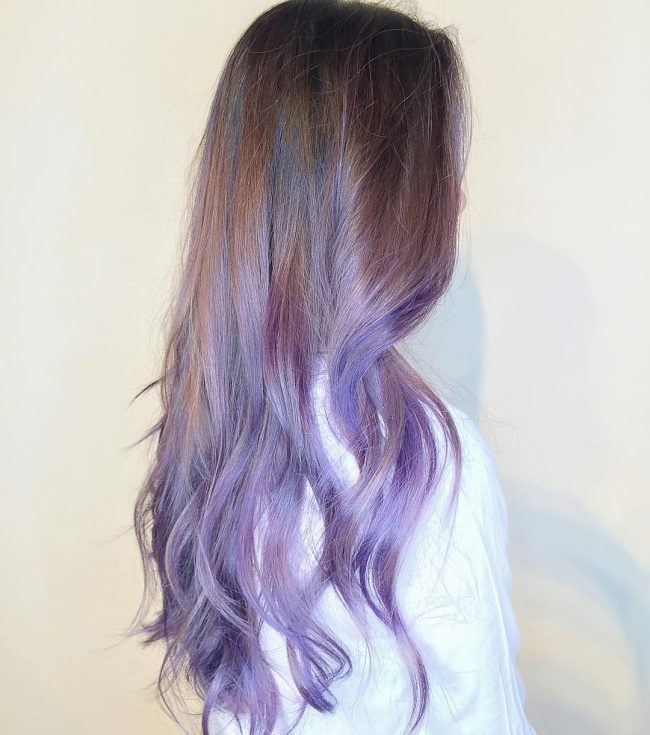 Here we can see a violet color has been used on the roots and it quickly dissolves away into pale pastel purple. This shade continues until the edges which are colored in soft beige blonde. This gorgeous waist length hair has been treated to a color sensation and left her looking like a princess. 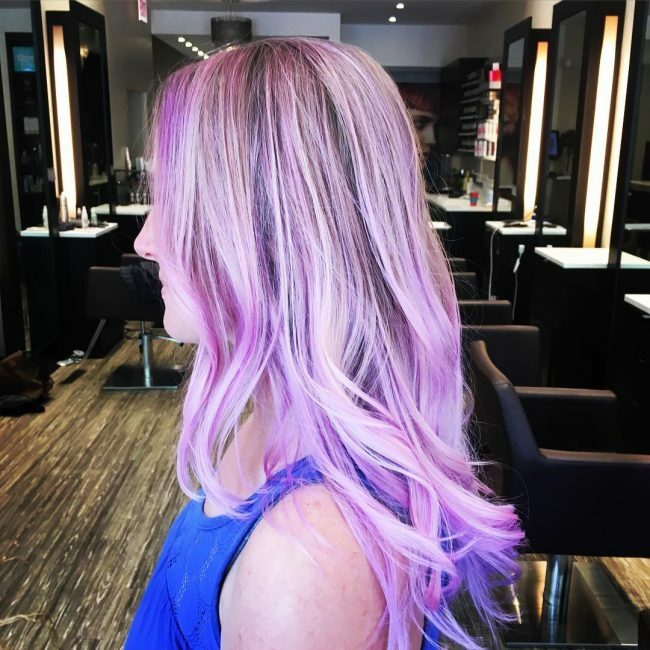 This pretty fantasy hair starts out in royal purple, which blends into pastel mauve before ending in a soft rose pink. All along the length, we can see that silver highlights have been added. To finish, the hair was styled into rolling waves. In this picture, the hair begins at the roots in sable brown which continues all the way to the edges. On top of this color, there are streaks of indigo, light brown, and pastel purple, which look great against the base color. To style the hair was given a high side parting and a loose curl along the tips. This unique hairstyle is sure to turn heads! She has started on the roots with inky black that melts outwards to become brick red. From this layer onwards the hair has been colored in silver and lavender. The edges have been cut chunky to add volume and the locks were ironed straight to show off the amazing color blend. For this gorgeous ombre, her long locks have been colored with toffee brown from the roots until past the crown. From there the brown breaks out into glossy metallic lavender and we can also see some gray at the transition. The styling was kept simple; loose S-waves were created with the lower hair. Full lavender color looks quite sensational, but you may be looking for something more subtle. Pastels are the answer! 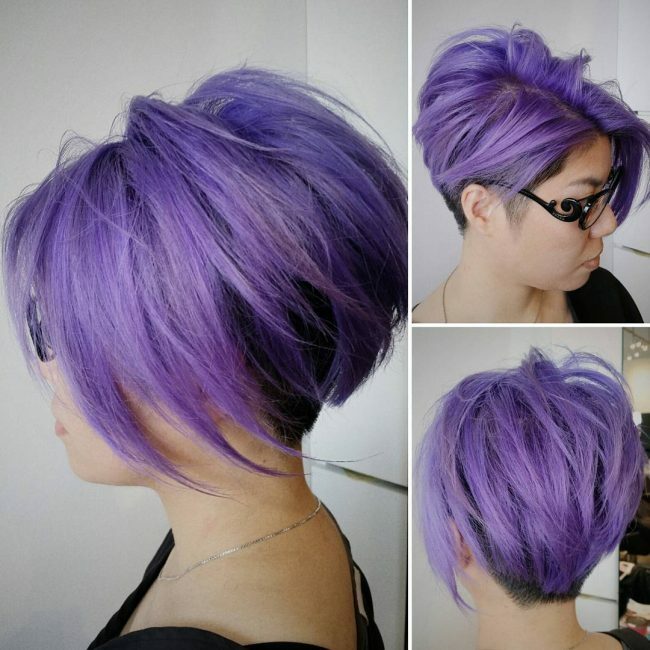 In this hairstyle, the stylist has colored the hair in a barely there pastel purple and styled it in the bed head fashion. This color looks great over shorter locks such as the models. In this look, the main color that was used is a creamy shade of light lavender, but darker sections of mauve have also been added to act as lowlights and provide contrast for the pastel shade. To finish off the look a loose braid was added over the top of the head and the rest of the locks have a naturally wavy finish. 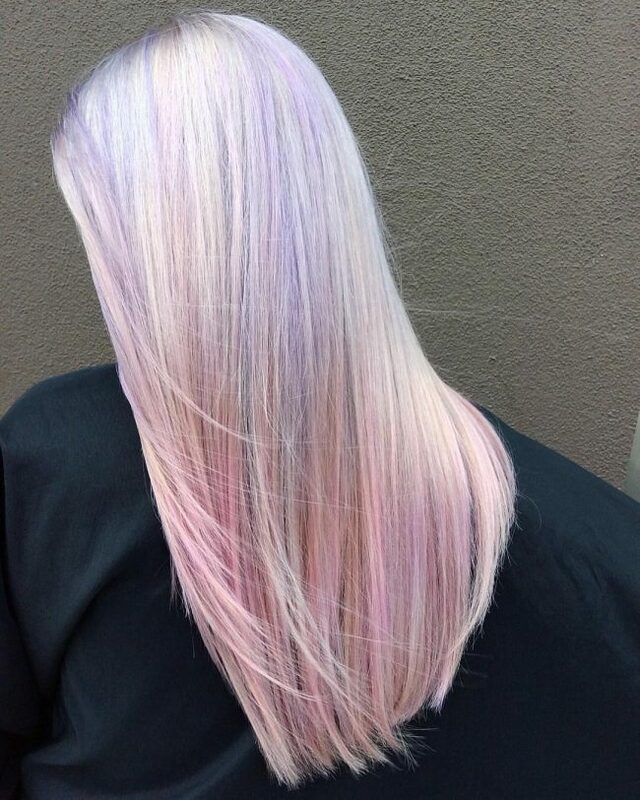 Here free hand coloring was used to give the lower section of hair a bright lavender splash. This color was applied over the base hue which is sandy blonde. Balayage is the best method to use to achieve this look as foils can sometimes make the bright colors seem harsh. In this picture, the locks begin in a sparkling amber shade which continues up until the neckline. From there the brown melts away, first into a thin layer of pastel purple and then metallic purple. To show off the color the locks have been styled in a half updo with a loose bun. If you look closely you can see that this pretty hair has slightly darker roots which help to balance the colored locks. 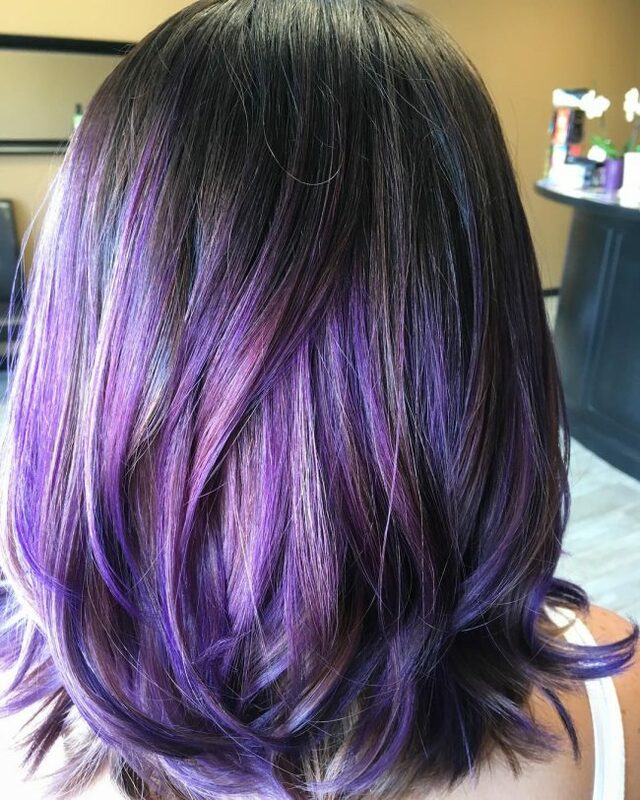 A sweet berry purple was used as an all over color and the hair has been given a wavy texture and styled in a loose boho-inspired do. 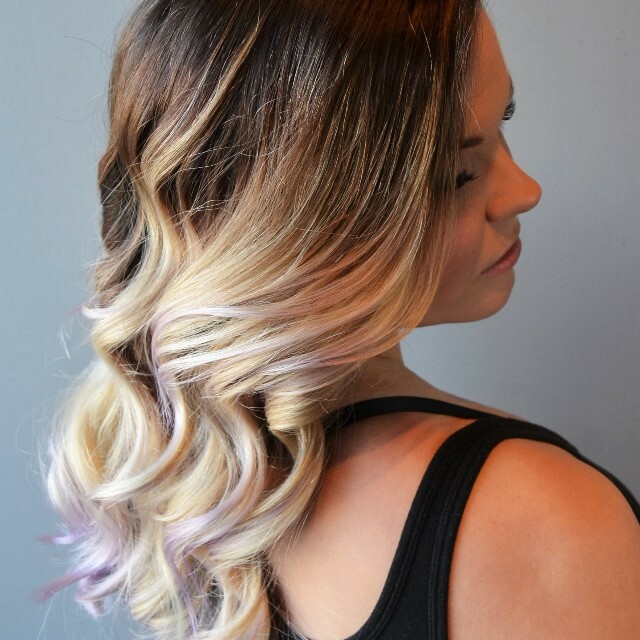 In this hairstyle, the color begins with smooth pastel lavender from the roots until the neckline. Starting in this section, streaks of white and rose pink were added. From the neck down the lavender hue dissolves into a light rosy pink shade with a few platinum babylights on top. To show off the color the locks were ironed straight. Spice up short locks with a burst of color like this. Here the roots are dark, but quickly give way to a true purple shade. Purple blends lighter until it becomes a silvery mauve all along the edges. To finish, the hair was pressed into loose curls along the bottom. Gray and purple are a stunning duo; especially when they are used to create darker looks such as this. Here the hair starts out in jet black before fading into shades of iron gray and matte lavender with a blue undertone. The locks have been styled with loose waves and she’s added a braid on top. In this picture the lower section of hair has been colored a daring amethyst shade with streaks of the same shade starting from the crown. 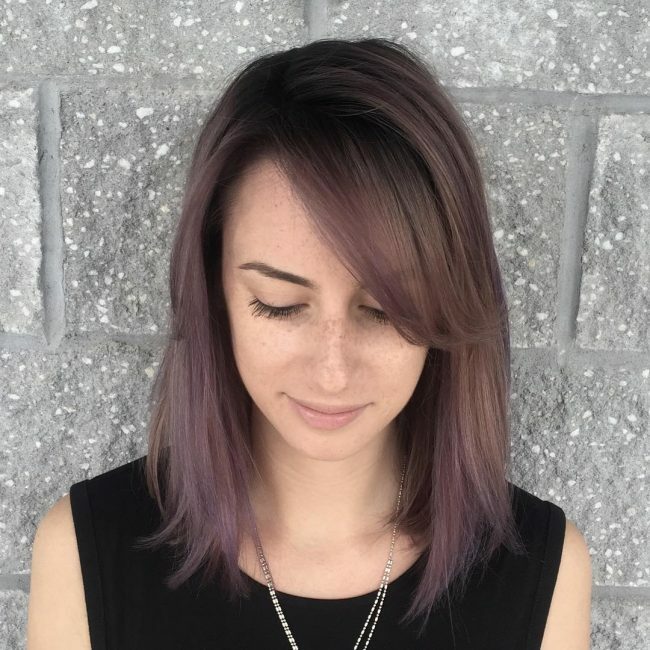 A subtle brown gray has been used to melt the mochaccino colored base color into this purple shade, creating an achingly beautiful hairstyle. 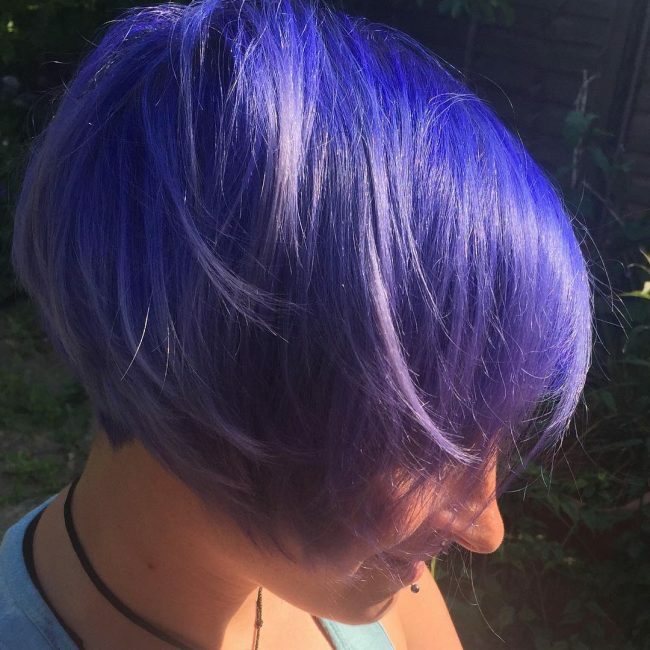 Short hairstyles need color that pops and this mix of violet-blue and dark pastel purple delivers just that. The base color is violet with heavy blue undertones which has been dissolved into a sparkling purple shade. Short bob hairstyles are not only easy to manage but carry off bright colors really well. 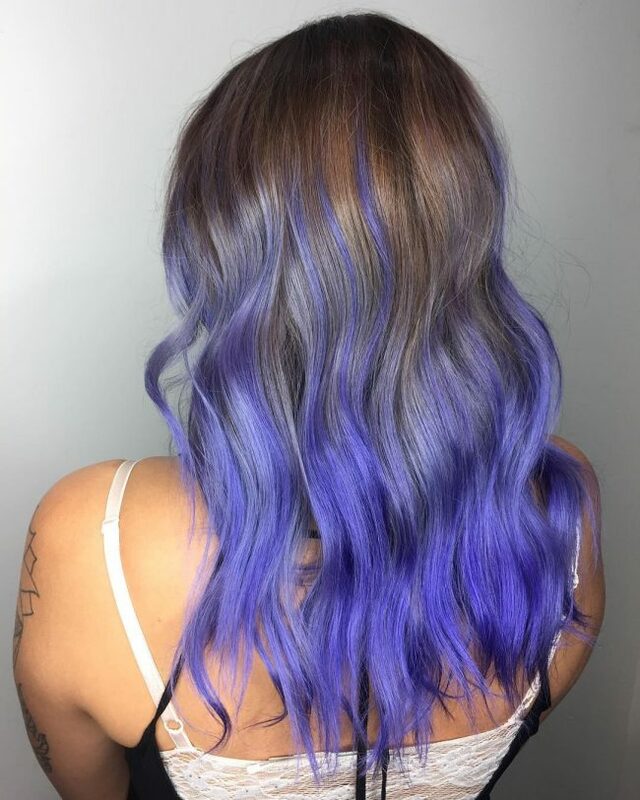 In this look, the majority of the silky locks have been treated to a wash of electric lavender with deeper shades of purple being added to provide contrast. Between these two shades, there are also some soft white babylights to help the colors shine. She has styled her hair simply with relaxed curls on the edges that have been draped over her shoulder. In this look, nut brown has been used to color the roots. This brown shade quickly dissolves into a fun loving beach blonde. 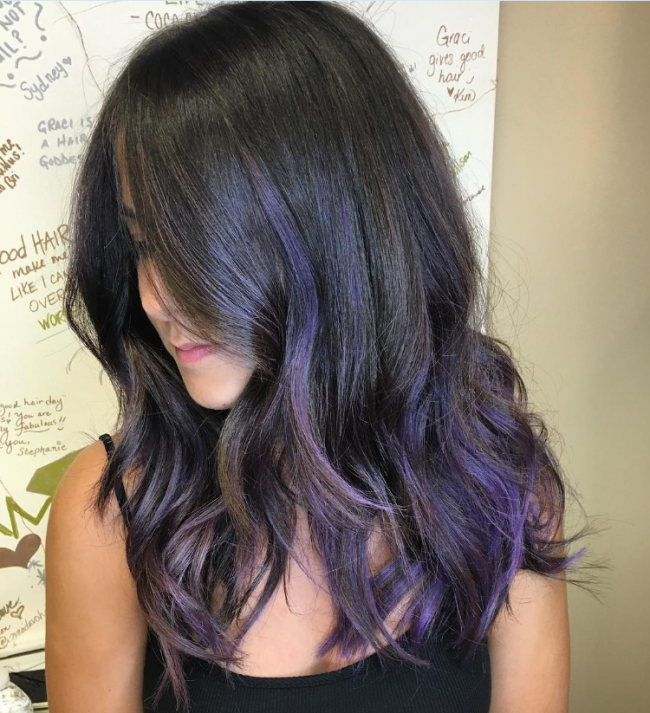 To add warmth to the style she has colored the tips in a pretty French violet shade. 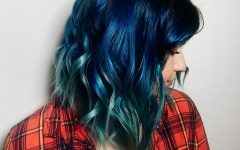 This “dipped” look allows you to try out bold colors and is best achieved with balayage. 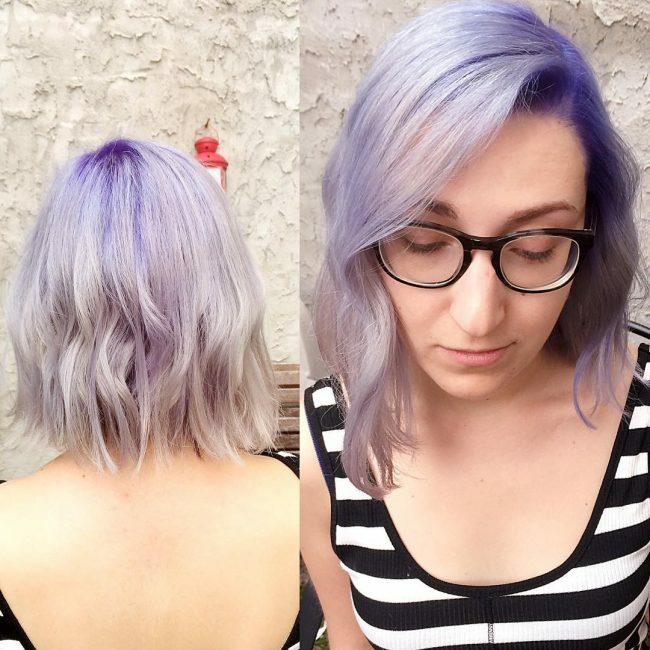 For this look, the stylist started with violet-blue on the top locks which fades out into a powder lavender shade. 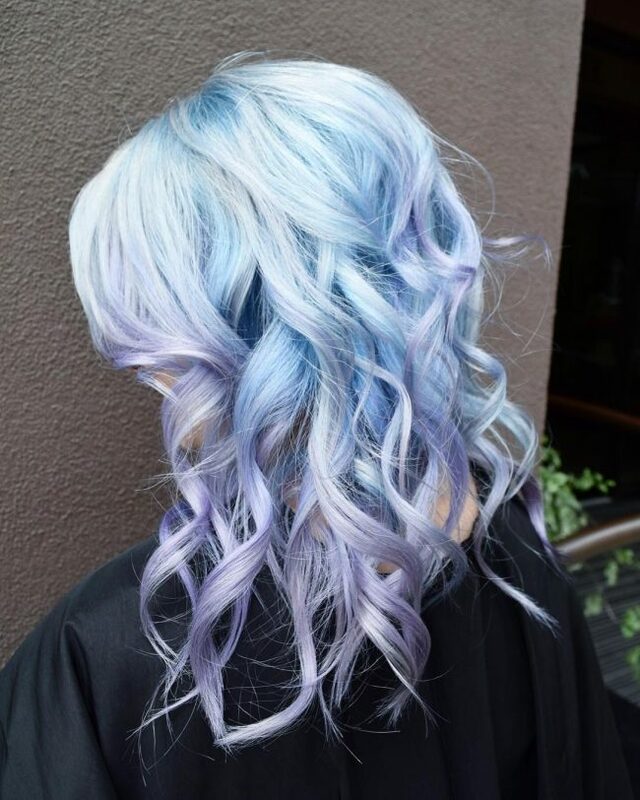 The last hue which shades the hair up to the tips is a light pastel purple. The hair has been given a beach wave finish and styled with a pretty waterfall braid. 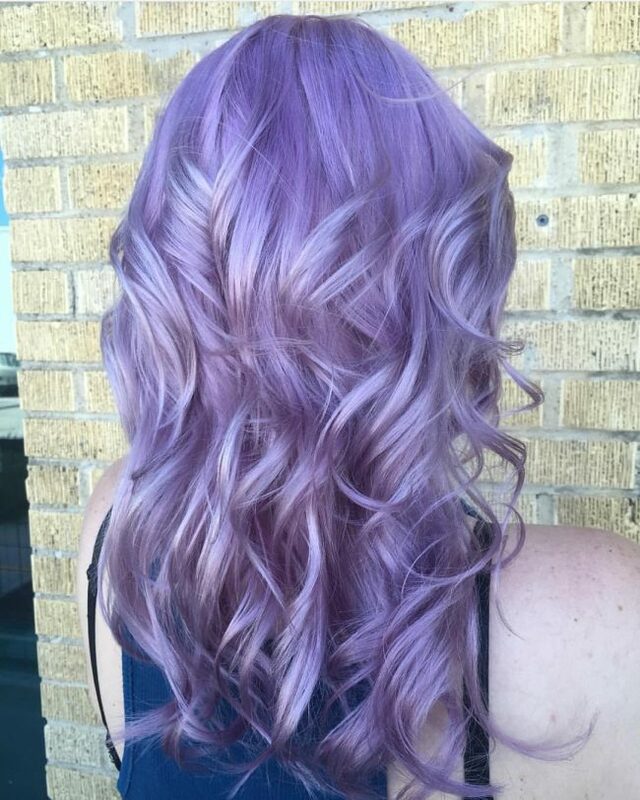 Nothing is more whimsical than soft purple locks. 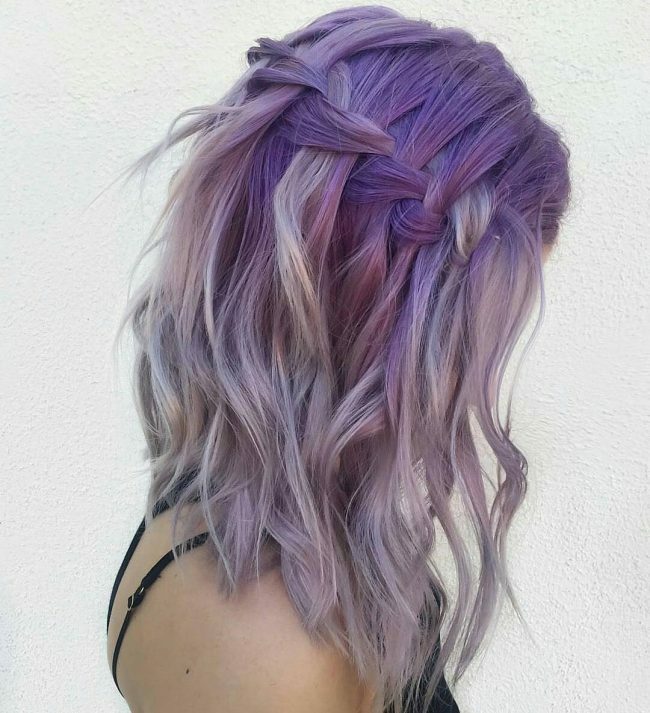 This model’s hair has been shaded in delicate shades of wisteria and pastel violet with numerous taupe colored babylights. Her mane has been swept loosely back with loads of flyaways and strands in front. This creamy purple palette works well with her dewy complexion and bright eyes. These lovely locks were given a chunky, layered cut at the back and then neatly flat ironed. The colors that were used were dusty pink along the bottom with true purple streaks from the top down. The ironed hair allows the colors to blend together perfectly and create depth within the hairstyle. 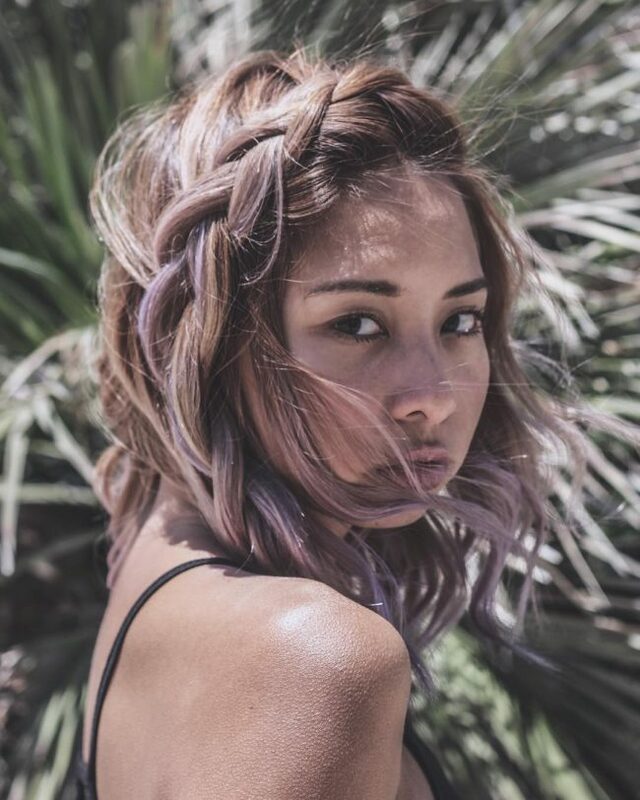 Metallic hair color is one of the hottest trends for 2016 so why not give it a try? As you can see from this picture the results are sure to be breathtaking. 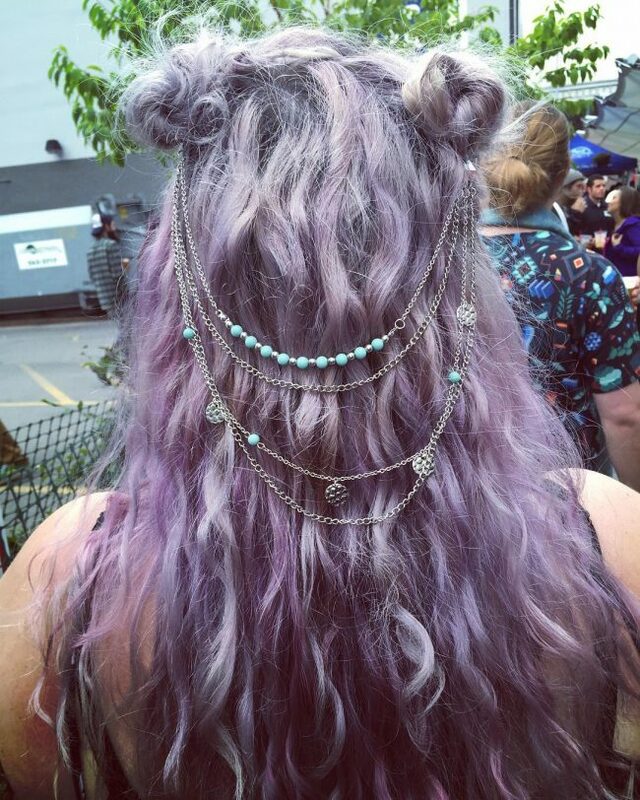 These locks have shaded using a palette of medium purple (on top) and mauve silver (on the bottom). The transition from one shade to the next is very smooth and the look is enhanced by the floating curls on the edges. 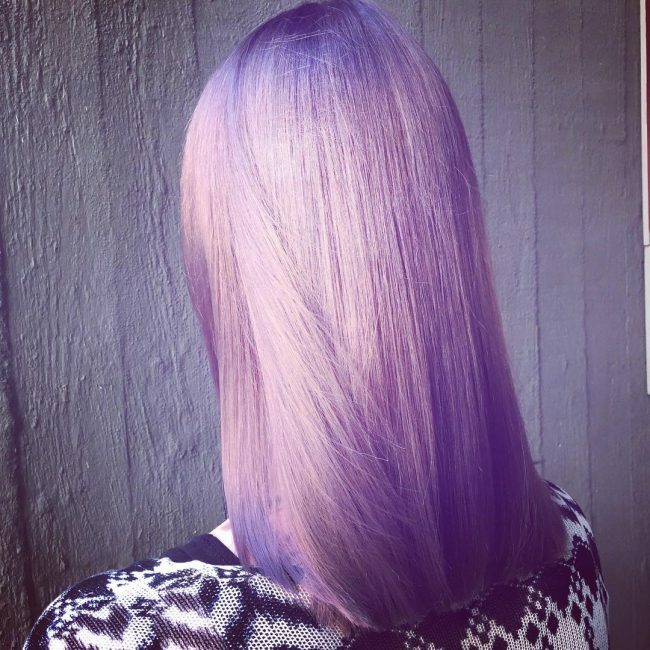 If you can’t quite decide on a lavender shade for your hair why not use all your favorites like she did? Within this wonderfully reflective mane, we can see true purple, berry pink, dusty rose and magenta. Balayage would be the best way to melt a range of colors like this together. If you really want your purple hair to stand out use a darker color like the sable brown in this picture on the roots. 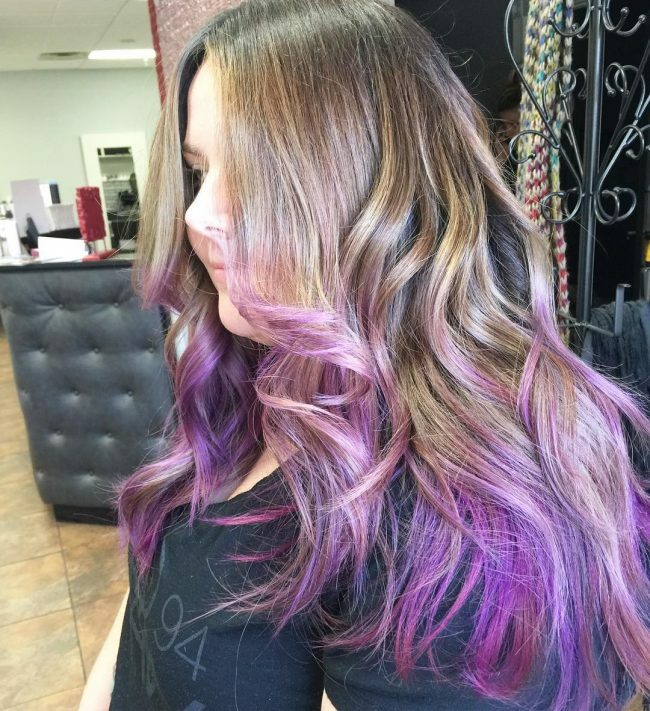 This brown highlights the rose pink and electric lavender streaks that have been added on top. A loose wavy texture will also help the hues gel together. 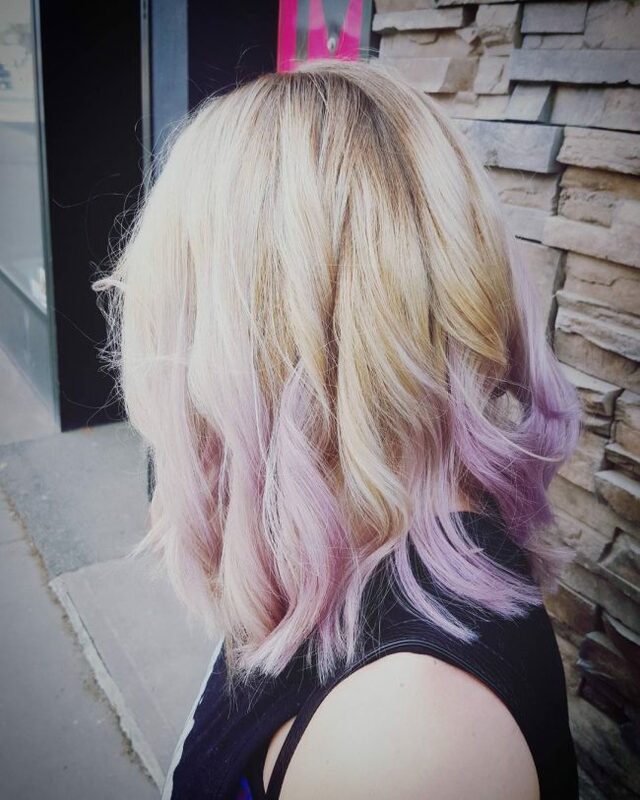 In this lavender ombre, the hair is colored a fine champagne blonde from the roots until just past the shoulders. From here the blonde fades out into pale lavender and the locks have been curled on the edges. The light blonde color has also been carried through to the ends, creating contrast for the light hues. Why not tuck a lavender surprise in-between your locks? This ombre blends from earth brown into baby blonde with some caramel brown between them. The tips, which have been given a gentle curl, are also blonde with a few light lavender streaks for effect. This pop of color finishes the look off really well. 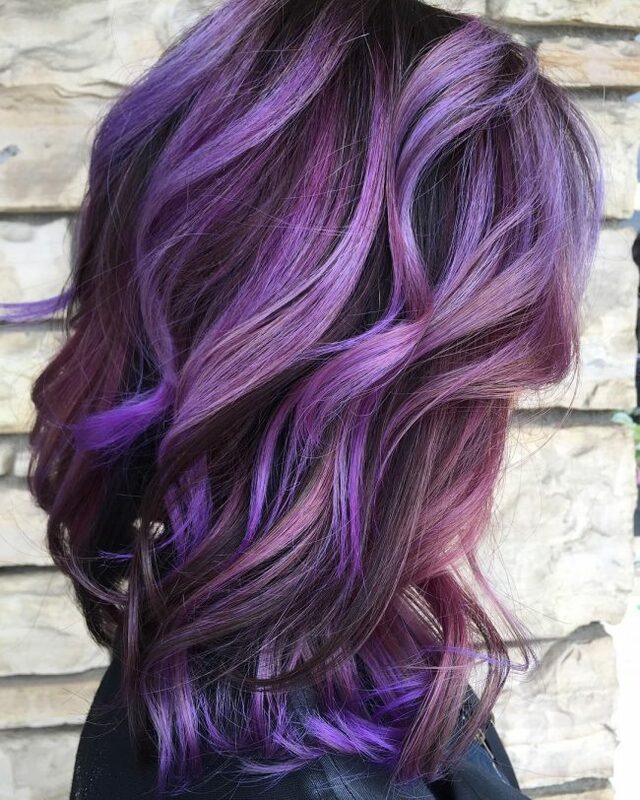 To create this funky hairstyle two shades of purple were used as well as a deep brown on the roots. The first layer has been shaded with a true purple hue and this melts away into a medium Byzantium shade which continues until the edges. To style, the hair was cut in layers with a wide fringe in front. 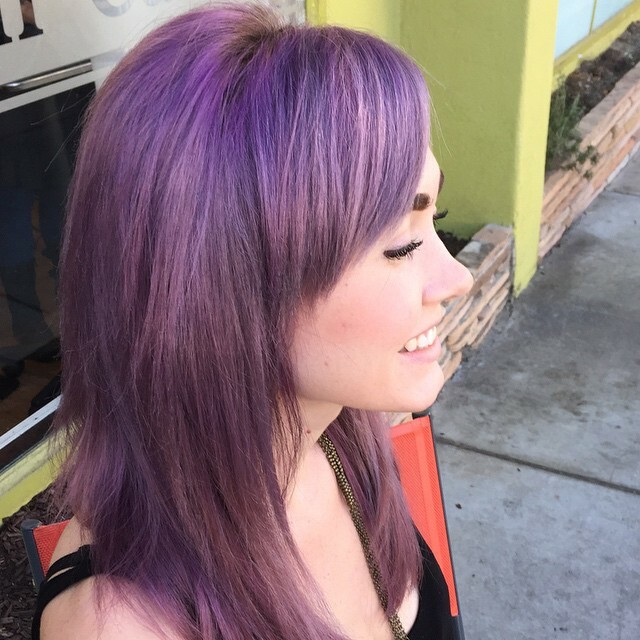 The base color for this girly style is bright amber over which streaks of dark pastel purple have been added. Both colors were used to shade the edges and the curls on the bottom also help the hues to blend. This incredibly well-blended color makes it hard to see where one hue ends and another begins. However, on closer inspection, we can see that the base color, seen here reaching just past the crown, is an electric purple. Out of this purple, the hair fades into a very light pink fuchsia before ending in electric purple once more. The locks have been ironed to a mirror finish. For this look, the hair was first colored with a rich rosewood shade at the roots. This color continues to the ends where it provides contrast. The streaks, which start near the crown, were striped with alternating layers of light lavender and blue-violet with pale rose pink along the tips. This smooth ombre starts with a midnight black on the roots which swiftly lightens into a milk chocolate shade. This color continues to the tips and is joined by streaks of subtle mauve taupe. 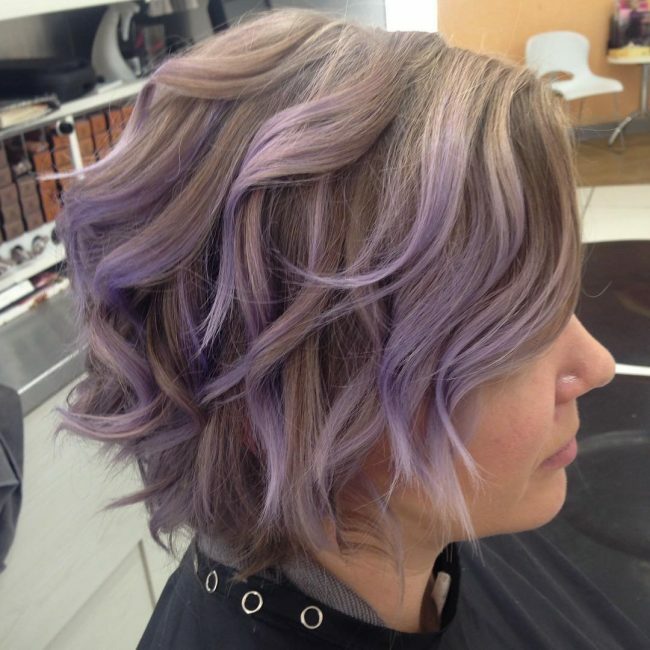 This pretty short bob has been expertly shaded using lovely complimentary shades of purple. Within the locks, we see dove gray, light blue-violet and amethyst with a darker gray used underneath to give contrast and depth to the style. 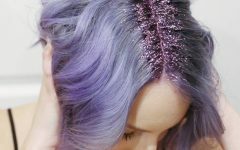 To create this gorgeous hairdo for Katy Perry the stylist used bright lavender for the majority of the locks as well as adding black to the roots and light pastel purple for the tips. As you have seen lavender is a color that you can use with dark or light natural colors to create an ombre or by itself to fashion a wilder look. There are so many shades to choose from that you will surely find one to fall in love with. 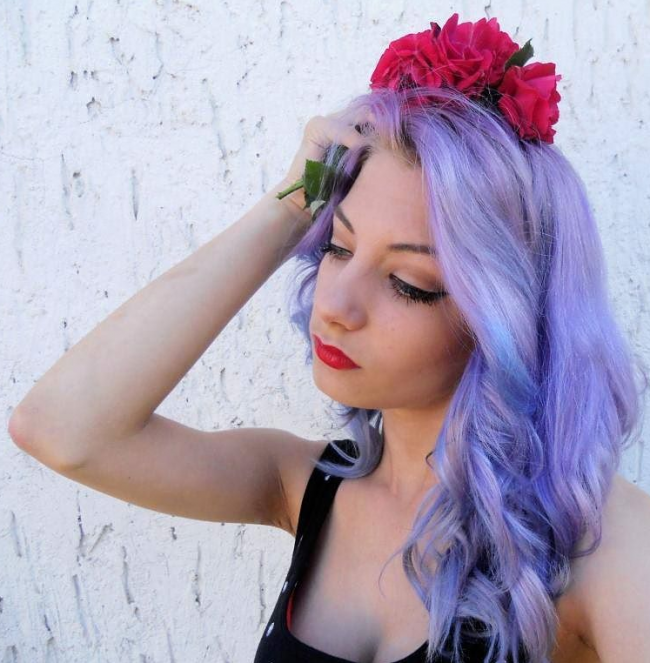 If you are ready for fun and feminine styles, then it is definitely time for you to get your very own lavender hair.